If you are visiting my blog for the first time, welcome! I hope you will take a few minutes to look around. I love traditional quilts, modern quilts, art quilts, pretty much anything and everything quilt related. 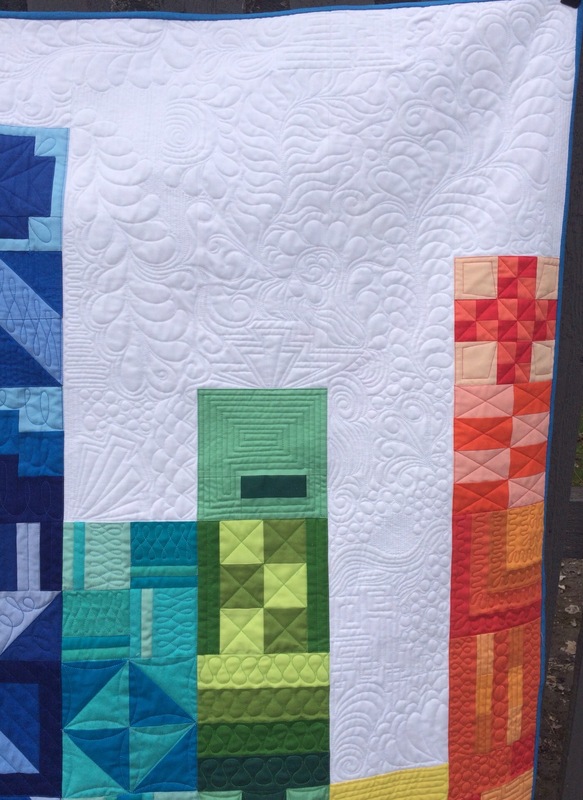 For those of you that already follow my blog, you have seen this quilt before. 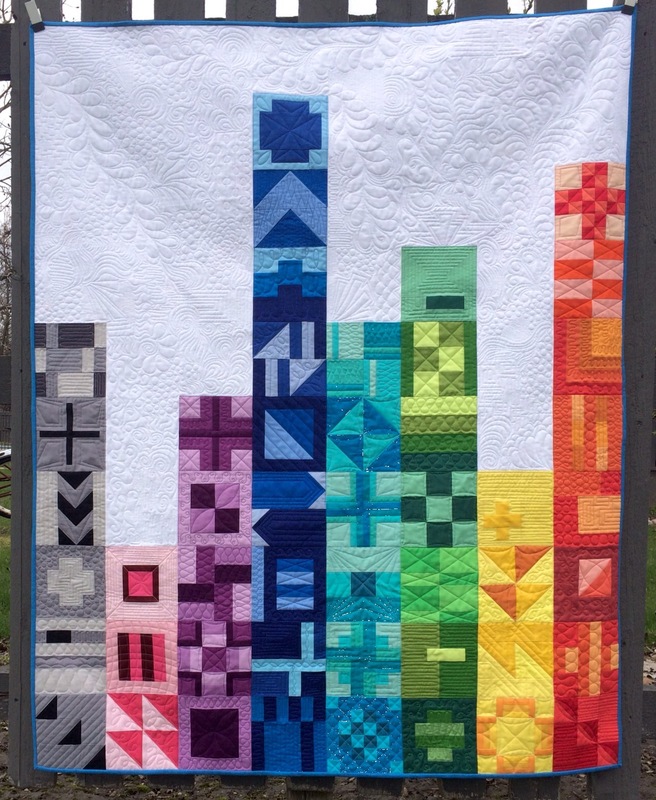 I am reposting it here as my second entry into the Blogger’s Quilt Festival for spring 2015. 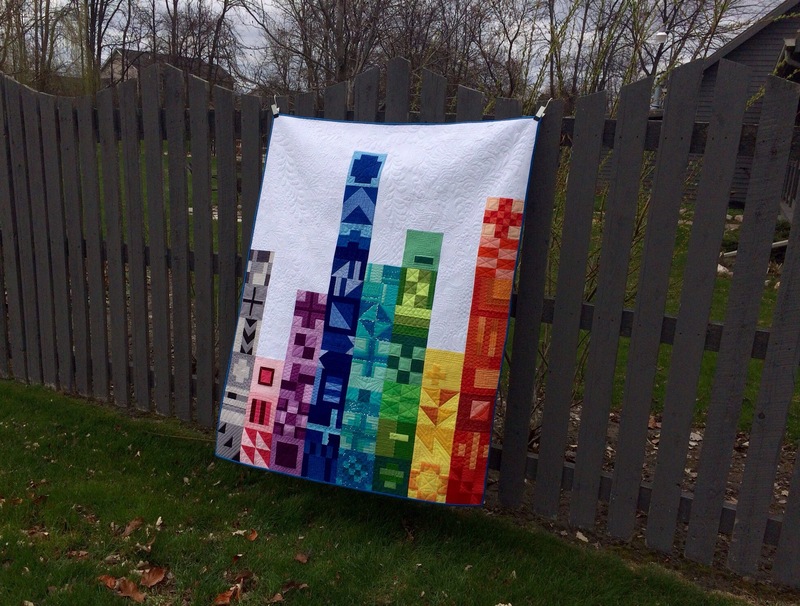 It is my City Sampler done in all solids and I am entering it into the Small Quilts category. Here are some detail shots. I had so much fun with the quilting on this one! All the thread on this is Glide from Fil-Tec. I changed color for each section and used white on the background. 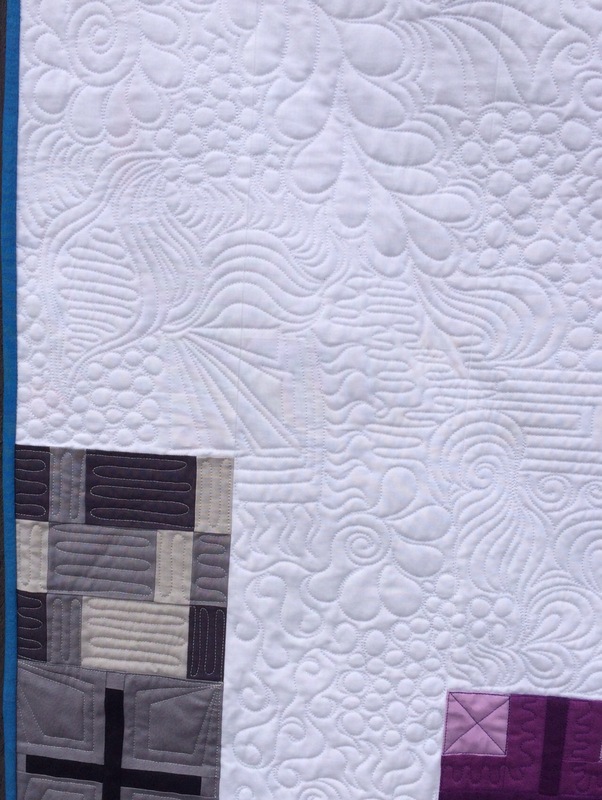 Check out the other quilts in the BQF SmallQuilts Category here. 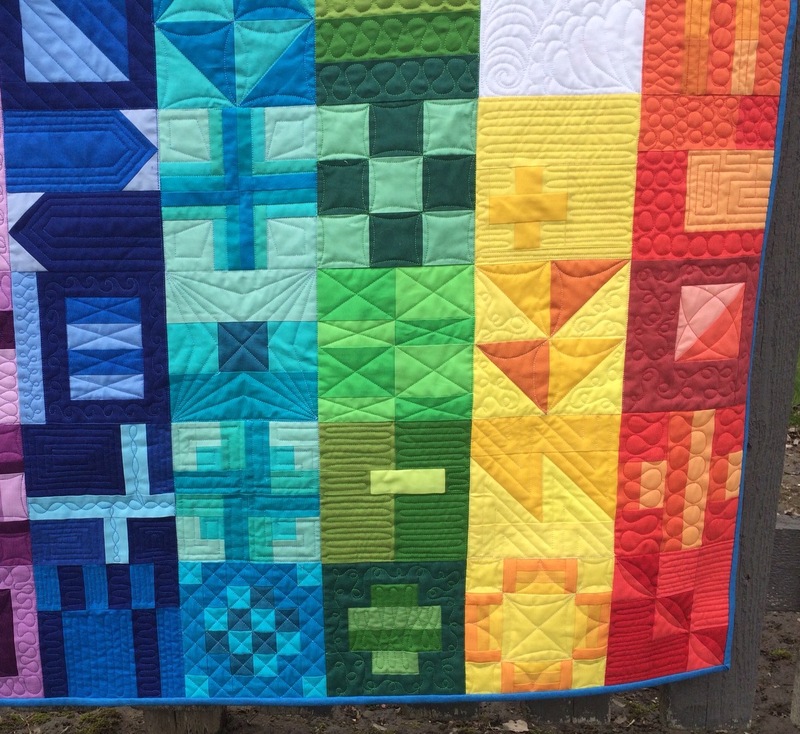 If you would like to vote for this quilt for Viewer’s Choice, you can do so here. Thanks for stopping by! Also linking up with Prairie Sewn Studios for Crafty Comment Karma. Great quilting and a stunning quilt design. You get my vote! Great job!!! Love this one so much! You definitely got my vote! I love solids, so of course I think this is simply gorgeous!! Oh! I love the colour in this quilt. You’ve clearly worked very hard to get the shadings just right. The quilting is beautiful too. I love it. What a pretty quilt, Katy! 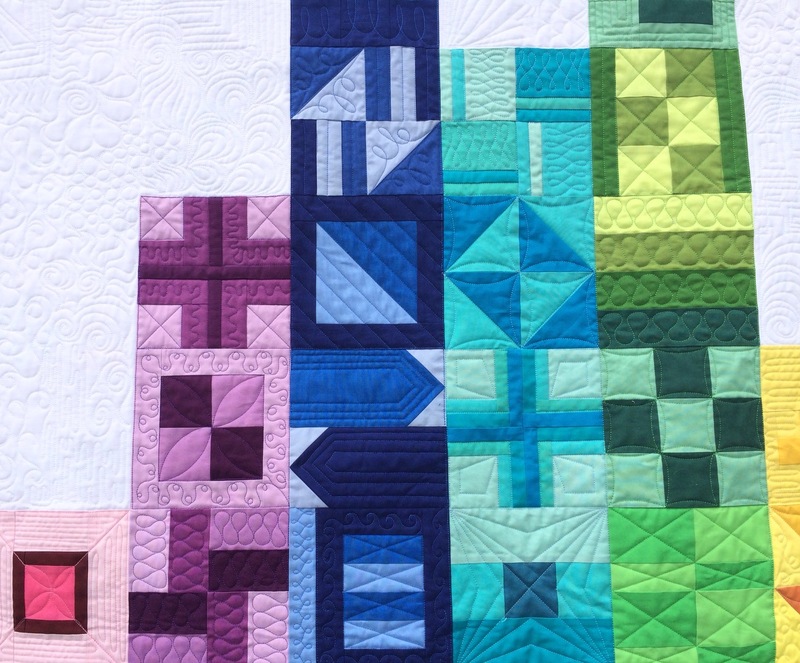 Not only are the colors attractive, but your quilting is spectacular! I love that free-form sort of FMQ. Bet you had a difficult time deciding which category to place it in as it would have suite ROYGBV and home machine quilted too. Lovely work! Beautiful! 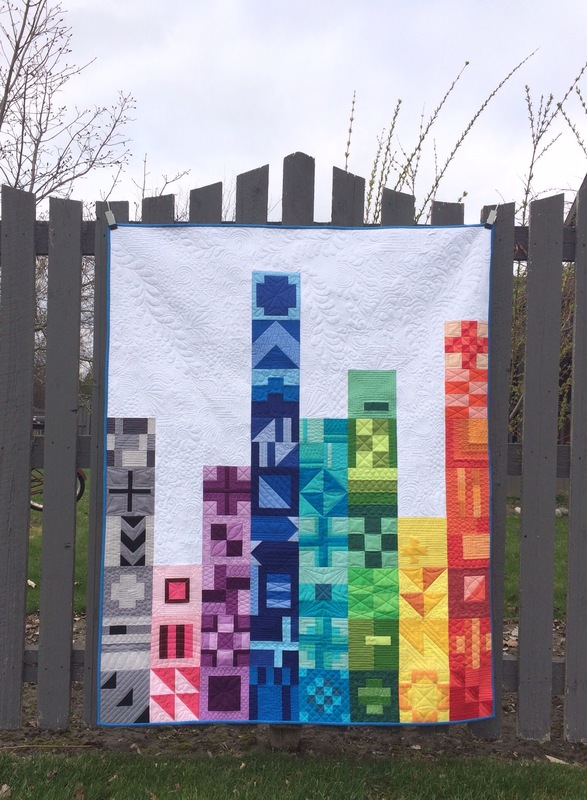 I made a City Sampler quilt too but ours are quite different. 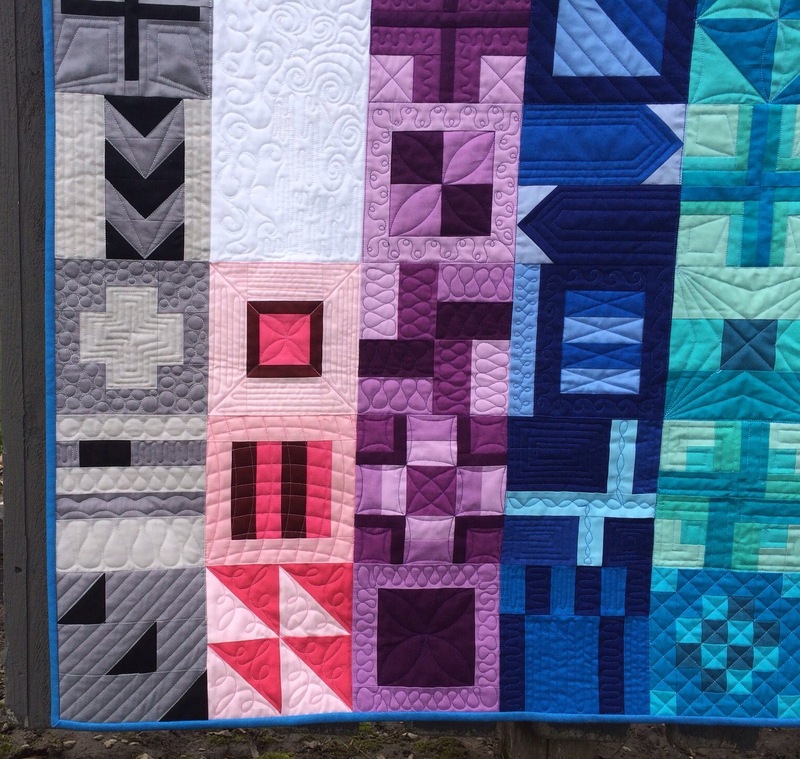 I love that yours is in solids, has a unique layout AND your quilting is just lovely! I love this! It looks like sky scrappers! This is gorgeous! You did a fantastic job on it. I think this is my favourite layout for these blocks that I’ve seen. 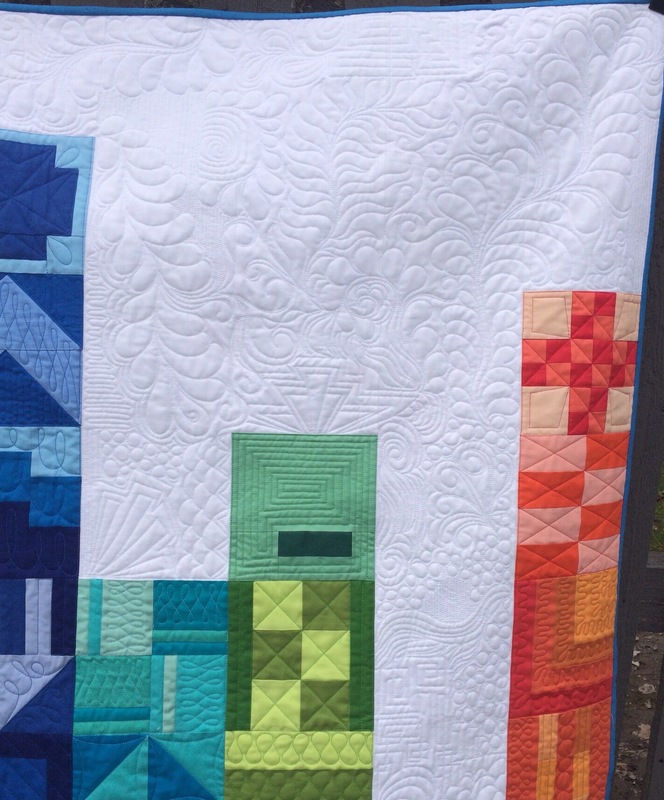 Gorgeous job on the blocks, layout and the quilting!!! Congratulations on a fabulous quilt. I remember seeing this under construction. It is FABULOUS all done! 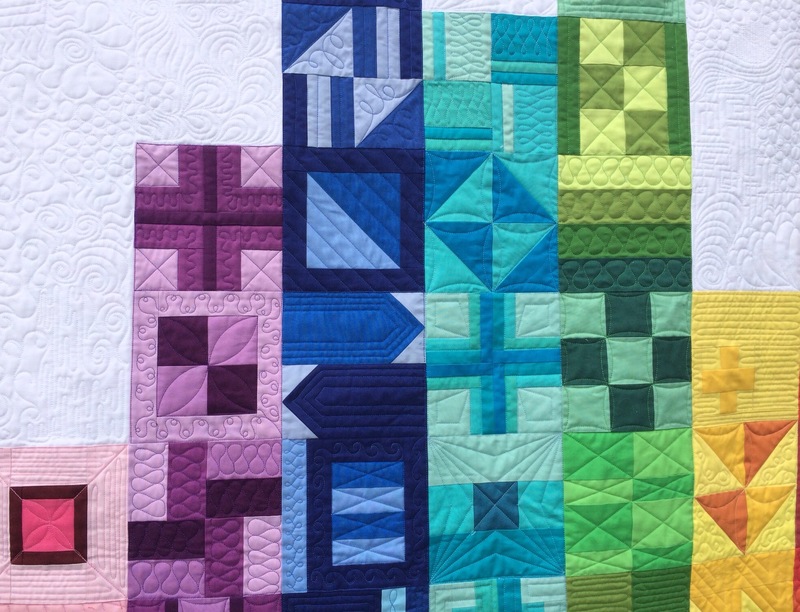 Love all the quilting you did! What a great setting – and that quilting is to die for! Lovely! I guess you did have a whole lot of fun with that wonderful quilting. And I love the back–what a fun surprise! Well I sure do love your City Sampler! 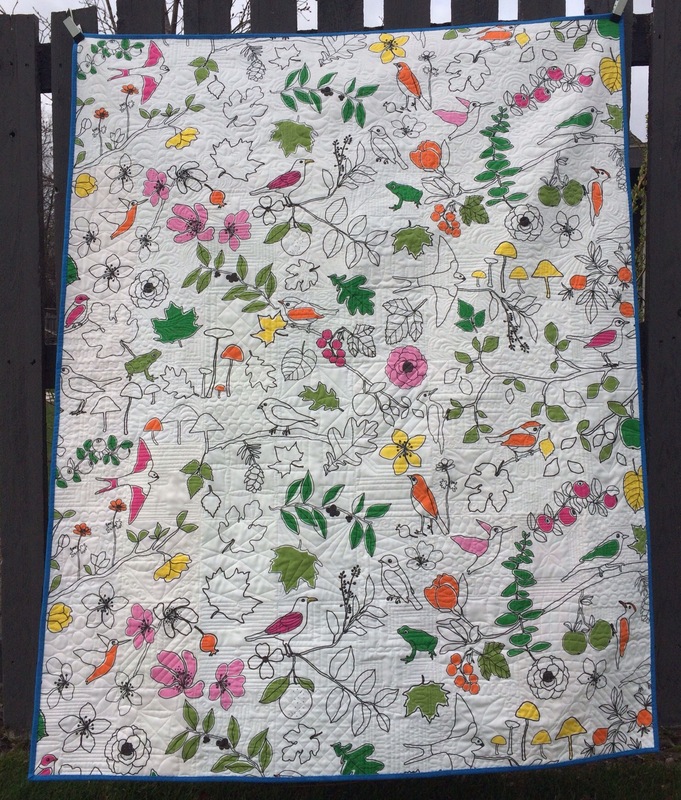 This is a great entry Katy and I am so impressed with your color sense and your quilting! Hope you feel A-Okay soon! Such a delight to look at! I love it! Everything about it is interesting. Thanks for showing it. I love this quilt. You have such a color stash. I love the lay out. The quilting is just amazing. I just love your graffiti quilting it pushes this one of the top. Looks like an urban sky line. Amazing! 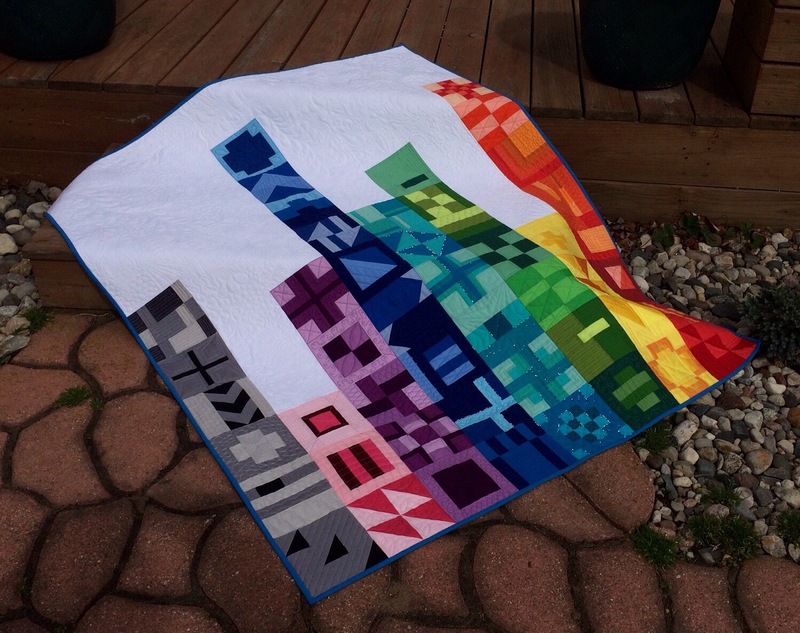 I love your design and the quilting is fantastic! I’m laaaate !!! Dear Katy, good luck ! It’s amazing. Great job on the quilting. wow, what a stunner! I love your layout choice and the way you’ve done the blocks in all solids. The quilting is exquisite! I loved this quilt when you finished it, and I love it now. Good luck!